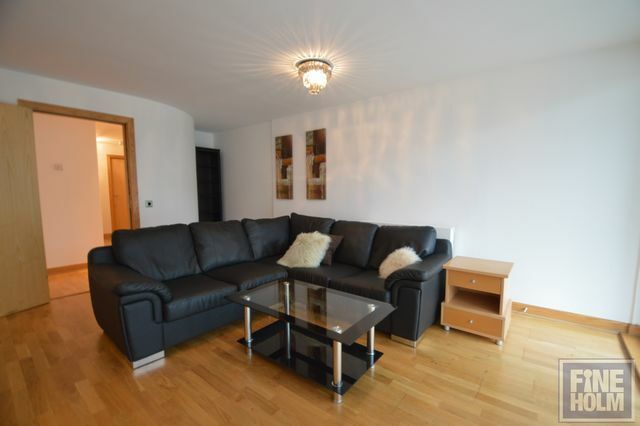 FABULOUS 3 BEDROOM MODERN APARTMENT IN THE HEART OF GLASGOW'S MERCHANT CITY. This immaculate, walk in condition 2ND floor flat is located in a well maintained residential development in bustling Ingram St with a private balcony and great views. The flat ( lift access) has spacious entrance hallway with 2 generous storage cupboards, bright and welcoming living room with private balcony overlooking an open grassy area with surrounding cafes, spacious dining kitchen with all appliances. Unusually this property has fantastic sized bedrooms with 2 large double bedrooms - the master a particularly spacious room with an en suite shower room off. Additional stylish bathroom with shower over bath and a third bedroom is located off the hallway with fitted wardrobes. The property has been freshly decorated throughout with new furniture in March 2018. GCH. Double glazing. Secure entry. Parking may be available for £150 per month. This property is ideally suited to professional single person or couple looking to be in the heart of Glasgow stylish Merchant city. With a range of restaurants, bars and clubs on your doorstep, this is true city living! The famous shopping district is also a short stroll away with designer shops and High street stores a plenty.